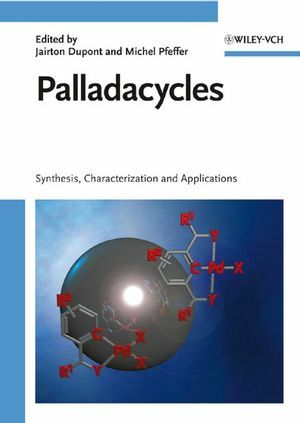 From synthesis to applications in catalysis, material science and biology this much-needed book is the first to comprehensively present everything you need to know about palladacycles. Renowned international authors guarantee high-quality content, making this a must-have for everyone working in the field. Jairton Dupont is Professor at the Institute of Chemistry in Porto Alegre. His research interests are organometallic chemistry, catalysis and ionic liquids. He is author of more than 120 publications, 7 patents and several book chapters. Jairton Dupont has received the Friedrich Wilhelm Bessel Forschungspreis of the Humboldt Foundation, the Simao Mathias Medal and the FAPERGS Award in Chemistry. Michel Pfeffer is Directeur de Recherche at the University Louis Pasteur in Strasbourg and he is working on organic synthesis mediated and catalysed by transition metals (CH activation, C-C bond forming processes and more). He authored more than 160 publications and has received the Bronze Medal of the CNRS. Stoichiometric reactions at the Pd-C bond and the palladium centre: Reactivity of the Pd-C unit with small molecules, e.g. alkynes, alkenes, allenes, CO, CNR, etc?